Welcome Everyone to Red Couch Recipes for Day Two of Blueberry Week! We have been feasting on blueberries this week. They are so sweet and good and inexpensive right now! I just love the rich color of blueberries! Blueberries have the highest antioxidant capacity of any fruit. Click HERE for nine other health benefits of blueberries from Women Health.Net. How to beat the heat? Make some sorbet! We had this delicious sorbet tonight. 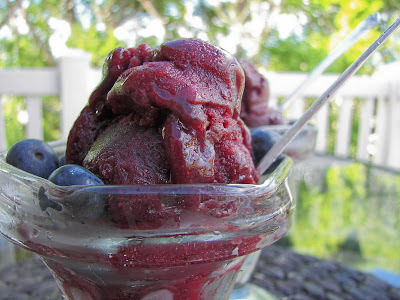 The "Food Critics," my family, really liked this sorbet! My 16 year old son was out riding a dirtbike when we ate the sorbet, but it won't last when he comes home! I just love the rich color the blueberries provide the sorbet! Blueberries have the highest antioxidant capacity of any fruit. 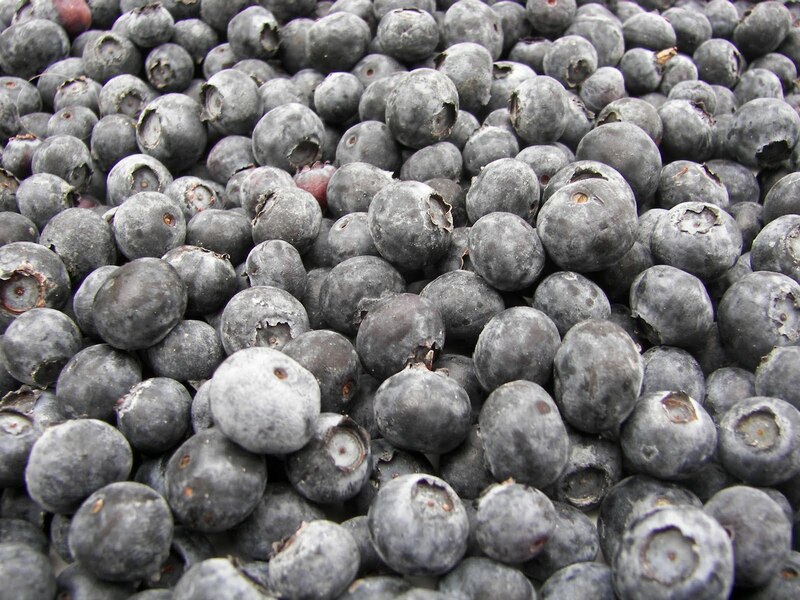 Click HERE for nine other health benefits of blueberries from Women Health.Net. Don't forget to enter my GIVEAWAY for 4 bottles of Girard Dressing; There will be FIVE winners! Click HERE for the GIVEAWAY. 1-1/4 cups sugar -- Depending upon sweetness of blueberries. 7-8 tablespoons fresh lemon juice -- depending on how tart you want your sorbet to be. 7-1/2 cups fresh blueberries -- This is almost 2 pounds of blueberries. In a medium saucepan, combine the sugar and water, bring to a boil while stirring, and cook until the syrup is clear. Take off heat and stir in the lemon juice and lemon peel. Let cool, cover, and refrigerate for 1 to 2 hours, or until thoroughly chilled. In a blender or food processor, puree the blueberries, then strain the skins. 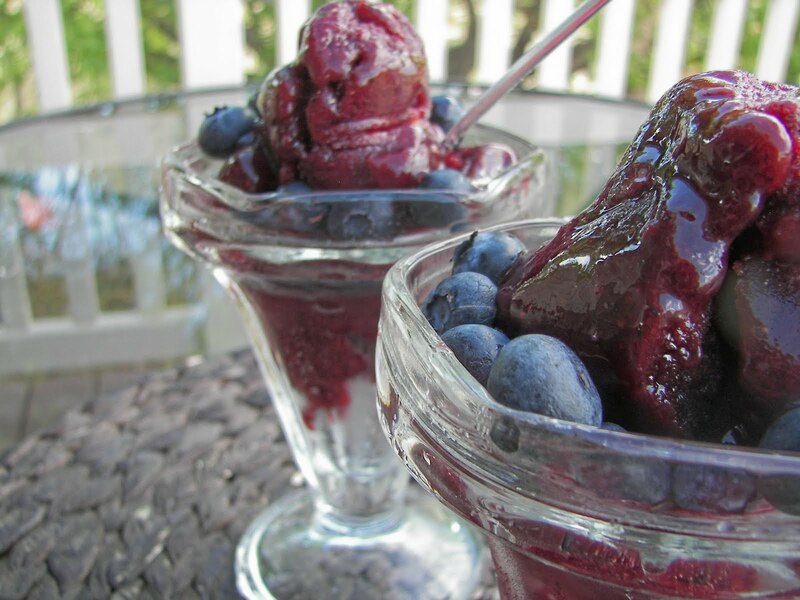 Add ground ginger to the blueberry puree; stir puree into the chilled syrup. Make sorbet according to the instructions of your ice cream maker. Notes: If you like, you can make this sorbet without straining the skins of the blueberries; if you do this you will need to adjust the amount of lemon juice. After making the sorbet, if it is too soft, put sorbet in a covered freezer container and freeze for an hour or two more. I am a huge fan of ginger, if you are not do not add, or add less! I hope you have enjoyed your visit at my Red Couch! Come back to sit a spell again soon! I always enjoy my visits to the couch! We've been eating blueberries here, too. As a matter of fact, I think it's time for another blueberry pie. Sounds great, I haven't made sorbet... yet! 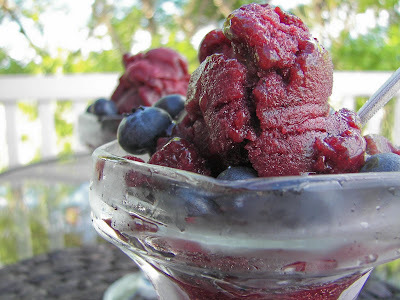 I have not made sorbet or ice cream or anything but I have been drooling at all the recipes! This look delicious! Gorgeous pictures too, thanks! This really looks good and blueberries are supposed to be a super food, ranking right at the top of the charts for antioxidants. I will eat mine, this way. I made this with stevia this morning. Will report back...it's just extra delicious looking and being so good for you yum...I couldn't wait to tell you!